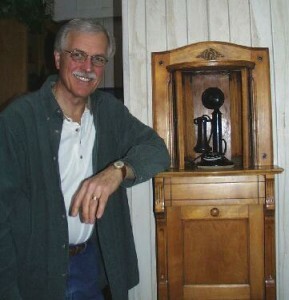 In this interview, Gary Goff talks about collecting antiques telephones, including wood, candlestick, and rotary desk models from Western Electric and other makers. Based in Orange County, California, Gary can be reached via his website. How did I get started collecting antique telephones? As a kid I always liked phones, using them, talking on them. As a teenager I had some business telephone equipment that was taken out of an old building that was being demolished. Bell System or Western Electric 1A equipment. I took it off the wall of this old building that my father had purchased that was in the path of the I5 Freeway in downtown Los Angeles. I took that equipment home, I was 15 or 16, and figured out how to hook it to our phone line so that I could have a hold button on the phone, it didn’t have lights, it didn’t have a busy lamp on the phone, but just having that phone with buttons and the hold key was very intriguing to me. After college I installed it in my first apartment and then my second apartment, and when I moved into my first home I installed the equipment there as well as lots of other telephones that I picked up here and there. All this was before 1984 and before the divestiture of the Bell System and before it was legal to own phone company equipment. My interest was in using these phones but not collecting. But in 1986 a neighbor of mine taught me how to refinish wood. We had some antique furniture and she showed me an easy way to strip it and prepare it for refinishing. I took a little trip that summer and in an antique store up in Central California, I found a bell box, what is commonly known as an extension ringer. It was made of oak, had a couple of bells on the top and it was a piece of trash and it was gutted and it was 12 bucks. So I bought it, brought it home, took the bells off took the hardware off took the box apart it had 4 sides and a bottom and a hinge top so I had 6 pieces and I practiced what I had learned about furniture refinishing on this box. When I finished and then polished the bells and put some felt on the bottom of this box, I had this really nice looking telephone bell box that would make a perfect bookend. I put it up on my bookcase then I realized that it was only on one end and I needed one for the other end and I found another one in an antique store here in north Orange County. And over a period of a year I collected about 40 different sizes and shapes of extension ringers, or bell boxes. Some place along the line I picked up a couple of bell boxes that had telephones attached to them and that was my downfall. I thought, maybe I should have some phones to go with some of these other bell boxes, even though that’s not how they were really used in real life. That was in ‘86, and since then I have been on the hunt so to speak. It kind of gets in your blood. Collectors Weekly: What do you collect now? 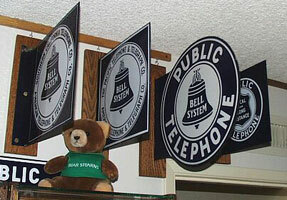 Do you collect telephones or bell boxes, or both? Goff: I got rid of the bell boxes, today I only have five, they’re all like new old stock, originals, perfect condition. The majority of my phones are what would commonly be classified as desk sets, phones that sit on the desk, so that could mean a candlestick, that’s the tall phone that you hold with your left hand and use the receiver with your right. Or the desk phones that sit on your desk, black usually, they have a handset on them that sits in a cradle. I also collect advertising porcelain signs, or telephone company porcelain signs from the various Bell System companies, there were something like 40-plus Bell System Companies such as Pacific Telephone, New England Bell Telephone, New York Bell Telephone (etc). I have about 20 of the 40 operating companies represented in porcelain signs. And then there are advertising attachments. In the early days retailers and vendors and product makers knew that if they put their name on a gadget that was attached to the phone that they would probably improve their business because people would see that advertisement anytime they used that phone and they would see that phone number and it might be the undertaker, the meat market, the local mechanics garage, the stationary store, a huge variety. These ad items come in the form of pencils, writing pads, advertising discs, even mouth pieces made of glass (so you could boil them and eliminate any tuberculosis germs). You could even carry those with you when you went someplace to use somebody else’s phone, you would unscrew their mouthpiece and you screw your mouthpiece on. Those were all basically advertising gimmicks called attachments and I have a huge collection of them. Collectors Weekly: It sounds like you have quite a large collection. What are some of your favorite items? Goff: Coin operated phones are among my favorite items… I have 3 or 4 coin operated devices that predated three-slot payphones (which themselves are getting harder and harder to find). Most payphones today are single coin chrome, but the old type had a nickel, dime and quarter slot at the top. 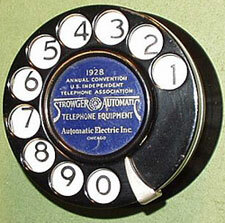 Before three-slots, there were ‘coin collectors,’ telephones that required coins to be used to activate them, made by a company called Gray, Gray Payphone or Gray Coin Phone Company. I have about 13 ‘coin collectors’, some which hung on the wall and collected just the coin and the operator could hear the coin going in, or some were a combination coin collector and built-in phone. They sat on bar tops and maybe in an old fashioned phone booth or a boarding house, or a dime store. These coin operated devices either locked the phone so that somebody couldn’t use it, or required that something be deposited to make the phone operational. They are among my favorites. Collectors Weekly: Where do you find new items for your collection? Goff: Well, eBay is the major source today. eBay is probably a good place to sell things because it kind of reads the supply and demand, so it’s the best venue for the seller and it’s probably the best venue for the buyer. The telephone shows that the collecting clubs sponsor in various parts of the U.S. are also very popular, and great places to buy items. I sponsor a couple of collector shows, in San Jose the second Saturday in November and in Orange County the first Saturday of March, and I never fail to sell items that I’ve picked up, refurbished, or acquired in some manner. And I seldom ever fail to buy something at a show. At the Tacoma, Washington show last month, I found a collector who is downsizing and had some rare attachment items for sale. I had an opportunity to buy a couple of those just because I saw them before anybody else saw them. If I had not purchased them the minute I saw them they would have been gone quickly. Shows provide the collector with a broad range of opportunities for purchase, but lately the rare and expensive items seem to be available on eBay because the seller knows that all of the people who are looking for things and have extra bucks to spend on some of the pricier stuff are going to be surfing eBay. It’s also expensive to go to shows, I’m going to Cincinnati on the 27th of August for the annual Labor Day Show sponsored by one of the phone groups. I’m using miles to travel but by the time I get there and help a friend pay for the gas from where I’m going to where the show is being held, and buy something, which I undoubtedly will, I will have spent some money. Most guys are putting a lot of money in gas these days, which is going to limit the participation. You can sit at home in front of the computer and look at eBay and probably do much better, who knows. Collectors Weekly: What are some key things you look for? Goff: I’m always looking for attachments, mechanical apparatus, celluloid advertising things, etc. Or I might be looking for a receiver, a long pole receiver, or what they call a pony, or an outside terminal receiver. Or I might be looking for a part. I go to a show with a little mental list, okay I need a such and such, that’s part of the motivation. I also have an eye out for one of those unusual pieces that I collect, and when you see it at a show you put your hand on it immediately signaling that this may be mine or I got here first. 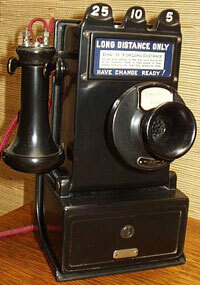 Collectors Weekly: What kind of challenges or obstacles have you encountered while collecting telephones? Goff: Indecision and lack of money. Like, oh my gosh, he wants $1,000 for that, it’s worth $1,000, but do I have $1,000 to spend on that, when there are so many other items I want? Or seeing what you want, and knowing that you want it, and just not having the kind of funds, we’re talking thousands of dollars. I recently purchased some things that were very, very expensive and on both of the items I can honestly say that my money is as well invested as it would be at a local bank in a CD, probably better. Nonetheless, indecision and funds are probably the two bugaboos in most collectors lives. Collectors Weekly: How else has collecting changed? Goff: The number of collectors has increased dramatically. In one of the two telephone collecting clubs, 3,000 people have joined that club since 1986. That’s way more in that same period of time than in the first years of the group. In other words more and more people are getting interested in telephone collecting. 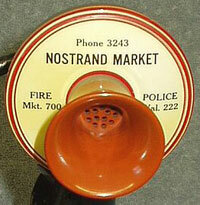 Maybe not the same kind of telephone items, but an interest in the hobby. What has changed over the 22 years I’ve been collecting is the availability. There are very few antique stores anymore and when you do find an antique store, it’s more of a collectible store than a true antique store. It’s got a lot of Beanie Babies and glassware and stuff that was produced maybe in the 40s, 60s, or 70s, because a 30 year old guy is very often looking for mementos and reminders of his youth, which would have been in the 50s, 60s, 70s. He’s not looking for phones that were built in 1890 or 1900 or 1920 or 1930, he doesn’t have a lot of interest in those eras. All of us are bemoaning the fact that there aren’t these antique stores all over the place that we can make monthly jaunts to or field trips to. The flea markets, there are still three major flea markets in Southern California, those three have always been there, but there used to be another three or four annual or semiannual flea markets, biggies, that we couldn’t wait to have scheduled. So, out here in California my local shows are more and more popular, they’re the only place a collector can go and see and talk with other collectors and have an opportunity to see things and buys things hands on. Some of the flea markets have gone away because they’re no longer profitable for the show host, the vendors sit at home and put everything on eBay for a small fee. Some people bellyache and moan about eBay fees, but eBay fees are cheap, cheap, cheap, when you consider that an antique dealer used to have to pay rent, insurance, sales tax, etc. Collectors Weekly: Are there any specific resources you would suggest for someone who is just starting out collecting telephones? Goff: Make every possible effort to get to a collectors meeting or a show. There’s nothing like meeting other collectors and seeing what they have to sell and trade, that is absolutely paramount. The other thing would be to join a collector club so that you receive a newsletter, something that advertises what people are looking for and selling or have to offer. Try to find out from the collecting clubs who might live in my area who’s a phone collector. You could go to Yahoo and join the telephone collecting Yahoo group, TCI’s Singingwires group. It’s free and you don’t have to be a member of anything, you just have to have an interest in telephones. There’s about 900 individuals on that list right now. I think getting to know somebody personally is a good idea, and going to a phone show is like going to a candy store if you’re interested in candy. You’re going to meet collectors and get more than you bargain for, really. There are also three books that are a must in my opinion. Two are by Kate Dooner, one called Antique to Modern and the other Seven Decades of Design. Those two are like coffee table books, with pictures and captions and short explanations, great for identifying telephones. I go to them immediately to look up something I don’t know. The third book is by John Dommers, a 1980s publication which is out of print. There are reproductions available… this book has more original stuff in it than the Dooner books. More of the older stuff, because it was put together by collectors rather than someone who went out to compile pictures of antique phones and put them in a book. It’s a more interesting and complete resource. Of course there are lots of other books, lots of books in addition to those. And I think the Internet is a good place to go for anybody who has a question about antique telephones just Google antique telephones. You could sit at home and never meet another collector and you could learn a whole lot more than you ever wanted to know about antique phones. Finally there are the two clubs, ATCA and TCI, with websites and they both have technical libraries and picture sites where members can post pictures for others to see, to either buy or learn about or show and tell. 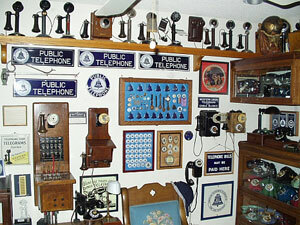 And there are lot of telephone museums in the U.S., some privately owned and some owned by telephone companies. They generally have websites and those are a phenomenal source of information, mostly visual information as opposed to text information. And there are collectors, like myself and many others, who have very extensive websites with text and pictures and some even have moving part demonstrations. I can sit for hours on end and surf the net and never even scratch the surface. But my last word is that it’s extremely important to get out to shows and meetings and make friendships, because those friendships will last forever and hands on experience is the best way to learn about telephone collecting. Hi Gary, My Uncle has an American Bell tehephone and it is dated 1896. Mechanism March 3, 1896. I am not sure about what kind of wood it is made of. Can you please tell me how much this phone is worth. Thanks in advance for your help! I am looking for a Western Electric Bell wall phone from the late 70’s, early 80’s. It is called ‘Noteworthy’ and, I believe the model # is 2950. It’s about 14 inches tall and 12 inches wide. The front can be changed from a cork board to a chalk board and there’s about 5 inches of storage between the wall and the memo board part for phonebook storage. A trim line phone hangs on the side w/out a storage opening. I have found this phone in yellow, rust and brown, but I am looking for white. I had a white one in the very early 80’s. Any idea where I might locate a phone like this to purchase and use ? internet searches have not been successful. ESTIMATED VALUE OF IT OR WHO I COULD CONTACT? Two years ago. before I started collecting phones, I foound two NOS W.E. Princess phones in a persons trash they had set out for pickup. I just thought they were Princess Phones and maybe worth $15.00 each. I ask if I could have the phones and was told yes. Seems they had belonged to the ladies deceased father a retired Ohio Bell Installer. I put the two phones on Ebay and to my disbelief the pair sold for $3250.00. Seems that they were the F52510 pre-production 1956 prototypes. I understand that there was only 1000 of these and that the test markets were Columbus, Ohio, where I live, and a city in Pennsylvania. That got me started collecting..now I wish I had kept one of the F52510’s. Hi Gary, i have an candle stick phone that has Property of The American Bell Telephone Company written on the back of the mouth peace of the phone,and it has the number 50AL on it also! it has an little plate with writing on it but i can’t quite read it.So i was just curious on how much you think its worth? Hey Gary, its me again(smile) i just seen an picture of the type of phone i have! its call an straight shaft dial candlestick automatic electric! and the dialing face is plastic!so what do you think its worth? Hi Gary. I have an old switchboard desk that I would like to find out the value of. It apparently was used in an old hotel in Paris, Texas, which is where I live. I hate to say it, but it’s not in real good shape, it’s been left on my back porch forever. But I think with some work, it would be really cool. I have searched ebay and can’t find anything similar. Can you tell me someone to contact. I would like to sell this desk. I am looking for the same exact type of phone as below! Can you advise on if these are still available somewhere? It is me, Ana Cristina from Brazil !!! Last one year the health of my mother was very bad and i was with her. Now everything is ok, thanks God. And you ? How are you ? I hope everything is ok, too !!! I want to be a member of the A.T.C.A. Do you think is it a good idea ? I am looking for a NICKEL Candlestick 20-B ( OUTSIDE TERMINAL RECEIVER ). Do you know where could i find it ? Please write for me !!! It may interest those of you who took the time to comment on my interview that I just learned this week that there were responses and or comments to that interview. I read the interview when it was first published and have not returned until it was suggested that I read the comments. I would like to apologize to any or all of you who may have expected me to reply and who by this time have considered me one rude collector. I would have replied immediately had I known of your comment. Thanks for taking the time to read the interview and for responding. 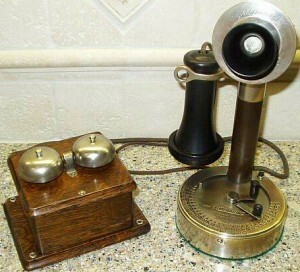 I have a candle stick phone which my father got from his brother in the 30’s. my uncle worked for the phone company and we had dozens of phones he gave us. I only have this one left. My father turned it into a lamp years ago, that you cut on by lifting the receiver. Unfortunately, he removed the mouth piece, and made that into where you put the light bulb. When you look at it now, it looks old and o.k. except I need the mouth piece. Any I have seen for sale on computer are extremely over priced. Is there anybody out there that could let me have a mouth piece I need at a reasonable price?? Hi, Gary – Do you have or know what the key looks like for a Western Electric Type 293A Wall Phone? i have an old wooden wall phone. It’s the kind you hold to your ear,then crank. The front opens up like a door and its heavy. I know its a western electric but thats all i know. It reminds me of the phones you see on old westerns you watch with your dad.You know, the ones people used when everybody knew everybody within a hundred mile radius. What i would like is to find a buyer for it. But what would i sell it for? can you give me some advice? We have an antique wood switchboard desk that is in pretty good condition. A collector said that it looked turn of the century, but that is all she knew about it at the time. The holes (where the wires/cords came up from below the desk?) are plugged with wood. We are wondering where we can find out more about is including what it is worth. Hello! I have a Old Oak phonebooth that is in GREAT condition! glass doors, working light and fan in place and original oak seat…. the interior is metal and has no markings or damage… the phone is gone, but wired to the booth for when a phone is added… the floor does have scratch’s but is not damaged other than normal wearand tear from years of feet traffic and usage. I have pictures of the booth if you would like to see… I am interested in knowing a estimate of its value and also its re-sale value in your opinion…. I live in Des Moines Iowa and noone seems to have the same estimate… so I come to you for advise and personal knowledge… I cant keep the booth, its much to large for my loft I live in, and it must be sold. Thank you for your time and i hope to hear anything you can regarding this message. I have an old telephone sign.It says on it “THE PACIFIC TELEPHONE (ARCHED )AND TELEGRAPH CO”(REVERSED ARCH)between the arches is the bell logo with “LOCAL AND LONG DISTANCE”.Along the bottom it says “PUBLIC TELEPHONE”.It is 34 inches long and 12 inches tall.Porcelain enamel,white with blue lettering.It is in good shape.Manufactuer is Ingram Richardson Beaver Falls PA & 100 William St NY,along the bottom of the sign.I have not seen another sign shaped like this on the internet.It is shaped kind of like a mantle clock.I will send you a photo if you like. Hi there Gary–I’m an old Bell Head, retired long ago from AT&T–My Uncle was a boy operator in the 1890’s in N.Y.—On your web pages-showing a wall of old tels., top shelf, 4th from the left you have an oak cabinet tel (two ringers on top–beautiful woodwork and tongue and groove corners; ) I have one like it —Mine is Pat. 1890 inside–American Bell shown and A.T.&T–most of the wiring inside and a list of Pat. dates on the outside of the box. Would I destroy any value by cleaning it up? How was this used? What was it known as? Value? Anything you can tell me is greatly appreciated! Freom what I see you have a fantastic collection!! Can you recommend and resources for identifying automatic electric telephones? There is a partial sticker on the back which looks like it says Monophone. It is tall like a payphone and has a lever on the right side which locks the handset into the base and the construction is very heavily built with the bells on the top. I have an old cord board that was taken out of a 40-room motel about 20 years ago. It was in working condition and has been kept out of the weather. I would like to sell it. Do you know if there is a market for this manual switchboard? Thank you. I have an orange noteworthy trimline telephone 2950 that was broken when another repair group disconnected it from the wall. the hand set isn’t working and the cord needs replacing. Is this something you can fix for me? I just love this phone! I have a county line telephone made in denver,colorado .I has an oak finish with brass bells and a green cloth cord.It works great i tried it out do you have any idea what its worth? 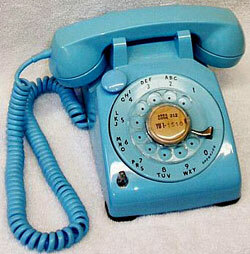 PS I have a green desk phone in our guest room from the 1960’s or 70’s that works fine and reminds me of those times. (Avacado green). I have a wooden box telephone by American Bell Telephone Western Electric. it has the candlestick for the ear piece. It has the number 300k on the back. It is in mint condition. Could you tell me the value of this phone? My husband & I came across a 1911 Wesco handcrank telephone. I can not find anything about the value or a picture. Can you help? Duane, thanks for your comments. I am 74 and my father was adopted early in life, most likely about 1922, by a William Goff. This all occurred in Southern CA. Bill Goff came from somewhere in the east, and died about 1930. He was a road contractor in CA. My dad was very fond of his stepfather and decided on his death to keep his adopted name. My dad’s real name was McCarthy. I have two daughters so no heirs to the Goff name. It’s a good thing that you don’t want to sell your switchboard unless it’s a very, very old one as there many of them around, they are too heavy to ship, and little demand. Good luck with your donation. This comment is for Dona, regarding a Wesco telephone. If this is a single wood box phone, it’s very common and not worth very much today. If it’s in perfect condition with all the original parts, then it could bring $100 to $150 on eBay today, but the value of these wood sets is much lower today than in the past. I doubt that there is much in print about this phone as it’s not much different from the same phone produced at the time by Western Electric, Kellogg, Stromberg Carlson, etc. Hi there. 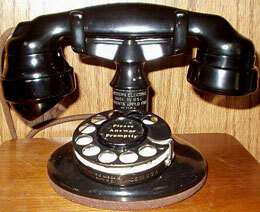 I recently purchased a Western Electric #50al desk stand phone. Could you tell me the correct Subset/Ringer box model# that would of went with this phone? Thank you very much. What is the model number of the 500 set shown in the picture at the start of this article. It is a 500 set with a light built into the phone with a small cover over the lamp. I have one of these in pink and I believe the bulb used in this phone is the same bulb used in Princess telephones. Through Richard Rose of Ericofon.com, I was directed to a manufacturer of LED lights which fit the Princess phones that have the lamp holder with the slit that allows the bulb to be pushed into the socket as opposed to the holder that the bulb screws into. I was wondering if the 500 set can be modified to accept the push in type bulb holder as the amount of light from the LED bulbs is about 10 times as bright as the old filament bulbs initially used in the Princess Phone. With an LED bulb the Princess phone has a truly bright night light and comes in various colors if you want to match the color of your phone or have a light in a color other than dull white. I have a black desk rotary phone by AE. It does not have the letters on the dial, just numbers that sit at the outside of the rotary. The only identifiying numbers I can find on the bottom are NB-802 ASA and then 4-66-10. Can you tell me any details on this phone. Hi Gary,I have seen a small part of your interview on the payphone edition of modern marvels and I have to say I like your western electric D-1(202) version of the pay phone, and I just recently joined TCI and I am a fairly new collector, I have seen your name in the collectors world for some time and I have seen photos of your collection—BEAUTIFUL! Hello Gary, I have a antique wall phone made of stamped sheet metal, with a magneto. It looks like the wooden Swedish phones. There is nothing to ID it. The receiver says Kellogg but I am not sure the phone is. I need the mouth piece for it, it is larger the 1″. I don’t see a mouth piece on line over an inch. Have you hear of this large course thread mouth piece? Your phone may be a Federal or Ericsson, but don’t know without a photo. The coarse thread mouthpieces are for Kellogg and Stromberg Carlson trans faceplates. They are available from Phoneco and from Oldphoneworks in Ontario, Canada. I have no clue, other than someone is likely stating ownership of Bell stock. I have not heard the statement stated as you have provided it, and know little about the practices of the early Bell System in this regard. 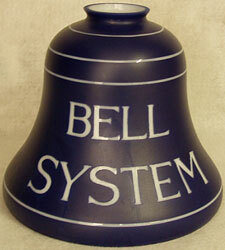 Most phone bells require at least 70 to 90 volts AC. to ring. phone was ugly on her living room table???? I have what I THINK is a cathedral style, candlestick phone table. It’s maybe an American country style table (chunkier spun legs) with a cathedral shaped box on top and a wood pull out board, possibly for writing on? Have you ever seen one of these? Picked it up in northern Wisconsin and have been baffled by what it is. It’s rather pretty. Have spotted a chair that looks like a school desk, but instead of a writing platform in front of you there is a 6-8 inch circle of wood with a circular baseboard around it with very old green felt on the bottom and a candle stick phone fitting in it perfectly. How common is this? “ ” Before pubescence, it’s cute for boys to be interested in science. After pubescence, it starts to get a little suspect. There's a fear that your child is going to be that creepy B-movie guy.